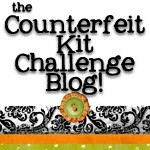 Counterfeit Kit Challenge: Happy National Scrapbooking....weekend! Tomorrow is National Scrapbooking Day, but we are starting the party early this weekend to give you plenty of time to get inspired and play along! We have 3 fun filled days planned for you, so set out a bowl of food and some water for the kids, get comfy clothes on and get your creative juices flowing! Little Blue Button Stamps has a shop full of great digital stamps, sentiments and more! Olga is offering TWO prizes for us! One for this weekend and the other all month long! National Scrapbooking Weekend Prize: $10 gift certificate to the Little Blue Button online store! Make a separate comment on THIS post for each of the above to be entered. I will draw a winner on Monday! Our second prize is a $20 gift certificate to the Little Blue Button online store! You will be entered for this prize for each link you post on this month's Mr. Linky! Your links MUST have to do with either the kits or challenges/projects posted for THIS month in order to count. So, have you finished your May kit yet? No? Well, get started on it! If you have already finished it then we have some extra inspiration for you! Melissa, from our DT, introduced me to CSI: Color, Stories, Inspiration! What a great site! So we are going to get our "Law and Order On" and try some of their challenges! To play along...pick one (or all) of the case files and create some kits based on them. Think about trying a page kit or card kit to mix things up a bit! Please head over to The CSI Blog to check out how AWESOME they are! And give them a shout out on facebook...tell them we sent you! Tomorrow we will be heading over to the crime lab to see what we can dig up. See you then! I've "liked" little blue button on facebook. I have joined the site. I like the "Pink crush" journaling cards the best. What a lot of lovely digi stamps - a new concept for me. I really like the Christmas tags - especially the one on the far left. I can really imagine using that on one of my Jingle Belles cards. I'm off to check out the CSI stuff now - also a new one for me.